This vigorous selection is easy to grow, with a nice year-round appearance. Shiny upright green foliage spreads slowly to form clumps up to 4 feet across. The real show comes in spring with a sea of white flowers with a splash of yellow in the center. Plant as an accent, in borders, along pathways, under oaks, in a meadow garden or even in containers. 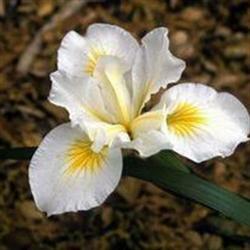 You'll love the showy flowers either in your landscape or as cut flowers brightening your home. Horticultural selection I. Douglasiana 'Alba': origin = seedling (19__) selected by Dara Emery; intro Santa Barbara Botanic Garden, 1978. Botanic Garden, 1978.